Analysis of how the Fed's response to a potential recession is likely to create some extraordinary profits even while devastating many other investment strategies. Detailed illustrations and price analysis of cash flows at different points in time, before and after the Federal Reserve's response. Discussion of how Fed cycles of crisis and the containment of crisis are increasingly dominating the markets, in ways that are not captured by traditional financial planning. In a previous analysis, we examined how to create a 21% yield, as the incidental byproduct of the Fed's plans for the cyclical containment of recession. From the viewpoints of most investors, this is a very bad combination; yet as we explored and can be seen in the rightmost red bar, this will also necessarily create some major profits, if we know where to look for them. 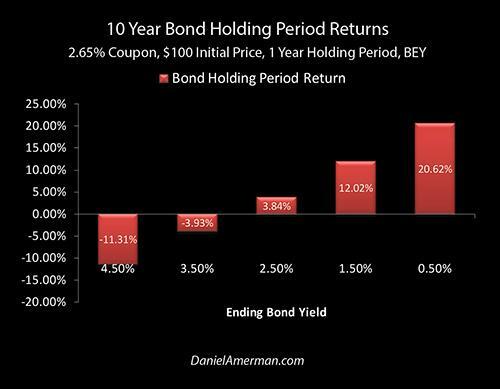 If we look at a one-year holding period on a 10-year Treasury bond with a 2.65% coupon, then based upon the assumptions in that analysis and the 10-year yield moving to 0.50%, that strategy would indeed produce a 21% holding period return. The graphic above is quite similar to the graphs used in developing the 21% yield, but it goes out 30 years in time instead of 10 years in time. 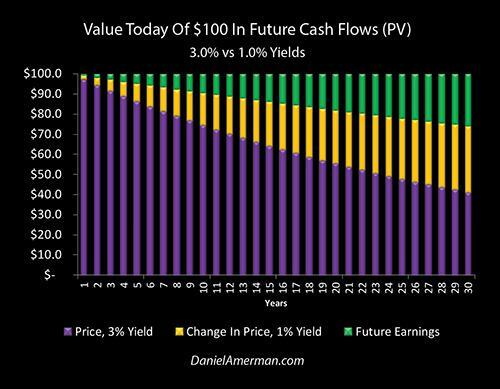 What the graph shows is the value today of a $100 cash flow in each individual future year - 1 through 30 - assuming a 3% yield. The 3% yield is not random, but is approximately equal to current 30-year U.S. Treasury bond yields. When we go out 10 years in time - the limit for a 10-year Treasury bond - then in order to get a 3% yield on that individual cash flow, we would pay $74.41 today (the purple bar), and we would receive the remainder of the $100 as $25.59 in future income (the green bar). However, what was the end point for a 10-year bond is just where things start to get interesting for a 30-year bond (or other investment with a 10+ year horizon, such as a stock or REIT). Go out one more year and the purple bar is already just a bit shorter. When we go out 20 years, then the price we pay today for the 100 dollars in the future is a mere $55.37 - and our green bar of income is up to $44.63. If we go out 30 years - which is where most of the money is with 30-year bonds, when the principal is repaid at maturity - then we pay a price today of only $41.20, and our green bar of income is up to $58.80. This form of present value analysis is a governing principle when it comes to investment prices, and it is of critical importance for determining the value today of all future cash flows within all investment asset classes. We are looking at bonds because they are the simplest way of looking at this; they are the fewest "moving parts" so to speak, but variations of these same principles apply every bit as much to stock prices and real estate prices. Fed Funds rates are not 30-year bond rates, but for the purposes of this illustration, we will assume that the combination of zero percent Fed Funds rates and early and aggressive quantitative easing focused on purchasing medium- and long-term Treasury obligations is enough to bring 30-year yields down to a round number of one percent. Let's revisit our 30-year price graph, but this time let's look at the new prices for each cash flow with a 1% yield. Those prices today are now represented by golden bars, instead of the purple bars of a 3% yield. As is visually obvious, the golden bars are much taller than the purple bars. For a $100 cash flow 10 years out, we now pay $90.53. For a $100 cash flow 20 years out, the new price we pay today is up to $81.95. With the 1% yield that is created by the Fed's desperately deploying zero percent interest rates and new rounds of quantitative easing in order to contain the crisis that could be associated with a new recession, then the golden bar in 30 years is all the way up to $74.19. When we combine the previous two graphs, then we get the graphic above. 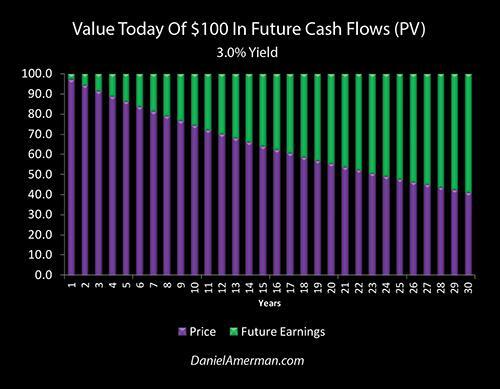 The purple bars are the prices we pay for $100 in cash in each year with a 3% yield. The golden bars are stacked on top of the purple bars and represent the increases in prices with a 1% yield. 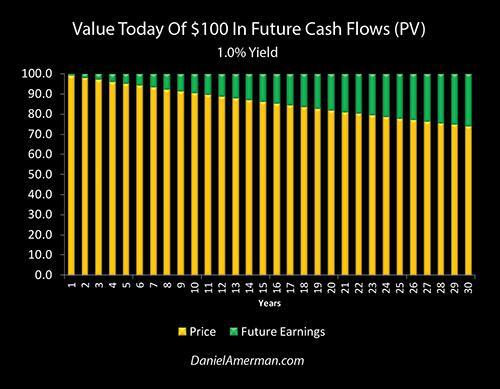 The green bars are what are left of the future earnings in each year with that 1% yield. As is visually obvious, the farther out that we go in time, then the greater the height of the golden bars - which means the greater the profits today. When we go out 10 years, going from a 3% yield to a 1% yield, it means that our price today increases by $16.12. Starting with the price today of a $100 cash flow that is 10 years out, when we buy at $74.41 with a 3% yield, the price rises by $16.12 if the yield falls to 1%, and that is an increase of 22% on our investment amount. Not bad. When we go 30 years out, then the price today for a $100 cash flow at a 3% yield is $41.20, and that rises to $74.19 if rates go down to 1%. So, the economy tanks, most markets crash, the Fed goes into panic mode, it slams rates down to zero percent, even while it creates trillions of new dollars out of the nothingness in order to buy U.S. government debt, stacking those medium- and long-term bonds onto its balance sheet until it grows to a fantastic size - and we earn a quick $32.99 on a $41.20 investment, which is an 80% return. Hmm, that's an interesting number - under those circumstances. It is also worth noting the 80% return figure applies to the principal that is returned at bond maturity in 30 years, and is therefore much more important than the price changes with the interim semiannual bond payments. For most people, moving from a 3% to a 1% yield may sound like a trivial movement between two low yields, with little profit potential, but the fundamentals which determine securities valuations show us a quite different picture. As explored in the immediately preceding analysis in this series (link here), when the Fed radically changes the (effective) risk-free rate in the attempt to escape crisis, its heavy-handed interventions necessarily send the value of money flying through time, with some categories of investors being enriched even as others are impoverished. 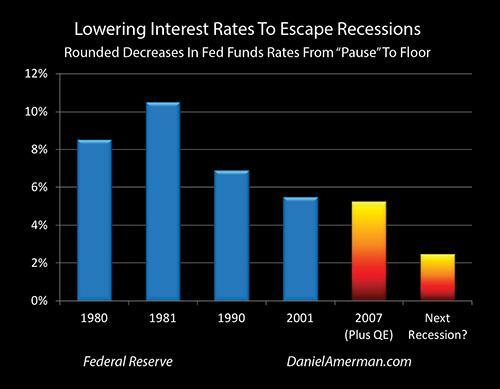 The farther out we go in time, the greater the Fed-induced redistribution of investor wealth. 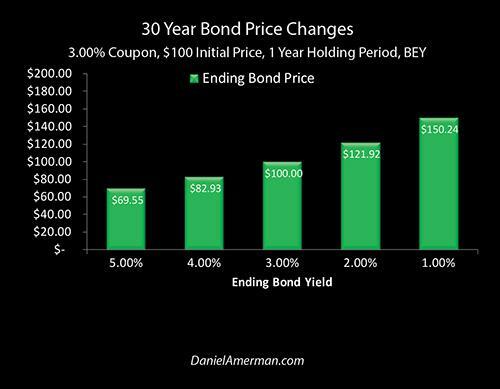 When we look at the cumulative total of the price changes for each of the 30 years of 3% interest payments, as well as the return of principal at bond maturity, instead of the individual cash flows, then we get the change in price for the bond itself. For a one year holding period, and moving to bond-equivalent yields (semiannual compounding), the dollar price on our now 29-year bond at an ending yield of 1% is $150.24. When we take into account the two interest payments that are made over that holding period (and we also look at the time value of money being discounted at a far higher rate than those interest payments), then our one-year holding period return is 47.87%, which rounds to 48%. 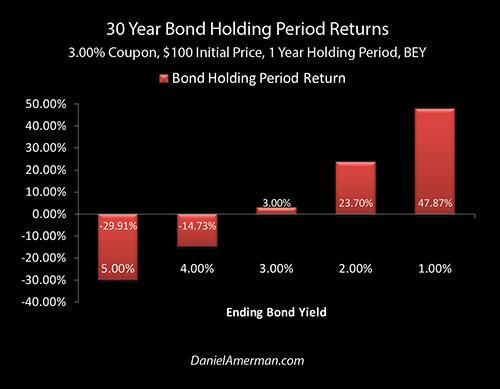 So, by going farther out in time, we were able to take that remarkable holding period return of 21% with a 10-year bond, and turn it into a 48% return by using a 30-year bond. When most investors think about the possibilities of another cycle of recession and of a return to zero percent interest rates, they see a double negative. The Fed took the unprecedented steps of zero percent interest rates and creating trillions of new dollars via quantitative easing in order to contain the last crisis. It has not had the time or room to unwind those all the way yet; they appear to be the new starting point, particularly if there is indeed a recession within the next 1-2 years. From that starting point, a swift and quite likely prolonged return to (at least) zero percent interest rates seems to be almost guaranteed as a matter of Fed policy. Those who would rather not think about Fed policy and would rather invest for the hypothetical universe that much of conventional financial planning is (implicitly) based upon, where none of these issues exist, are likely to be savaged, and perhaps again and again with each iteration of these still amplifying cycles. Each time, these investors will think it is another round of remarkably bad luck, when it will in fact be quite the reverse. What the Fed is doing is happening in plain sight, there are headlines in the financial media about one aspect or another just about every day, and these interventions have openly dominated the markets for more than a decade. Those who refuse to take these extraordinarily powerful market-distorting interventions into account are likely to personally pay the consequences in full, again and again. However, if we can accept the reality of the situation, where a Federal Reserve caught inside of a trap of its own making is almost certain to be making massive market-distorting interventions with the next iteration of recession and the underlying business cycle, then we can look at this situation from an entirely different perspective. The way that financial mathematics work, extraordinary profits will necessarily be created along with the extraordinary losses, and the key to financially surviving - and possibly financially thriving - is to understand where the non-random, artificially-induced losses and profits are most likely to be found in each investment category, in each phase of the cycles, and how they can be at least partially seen in advance. This analysis, in combination with a previous analysis, explored one such pocket of opportunity. In the 21% holding period return analysis, using a 10-year U.S. Treasury obligation, the fundamentals were illustrated. This analysis showed how to concretely take advantage of how a desperate Fed will move wealth through time, and a methodology was illustrated for bringing that yield up to 48% (based upon the assumptions used herein). The graphic below is an organizational framework I created to help explain how the changes in the cycles of crisis and the containment of crisis can change investment category results at various stages in those cycles. 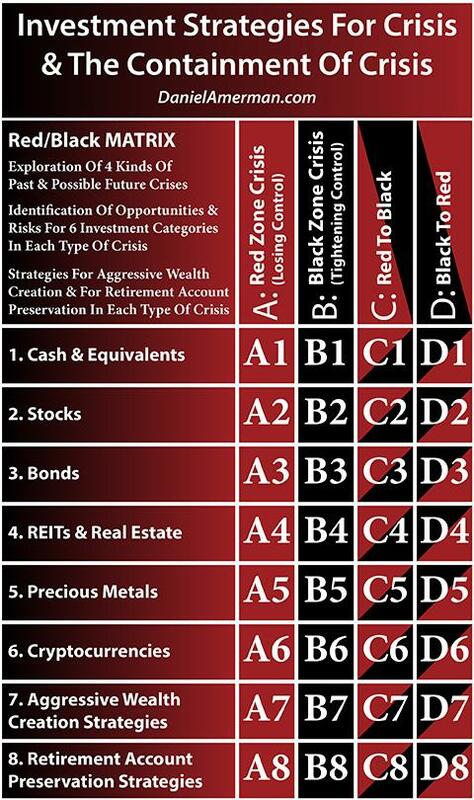 In this case, we have been further exploring matrix cell D3, which is the intersection of the D Black to Red column for the cycles, and the third row, which is the investment category of bonds. This is a real and viable opportunity - contingent upon the assumptions shown herein. That said, our last full cycle included not just record high prices for bonds, but record high prices for real estate and stocks as well. The third row of bonds is a good place for learning, because of the relatively fewer variables, but if there is indeed another recession and another cycle of crisis, and if that is followed again by another cycle of the containment of crisis, then bonds will only be the appetizer. Most of the money will eventually likely be found - again - in rows 2 and 4, the main courses of stocks and real estate. Additional disclosure: This analysis contains the ideas and opinions of the author. It is a conceptual and educational exploration of financial and general economic principles. As with any financial discussion of the future, there cannot be any absolute certainty. While the sources of information and the calculations are believed to be accurate, this is not guaranteed to be true. This educational overview is not intended to be used for trading purposes, those making investment decisions should do their own research and come to their own independent conclusions. This analysis does not constitute specific investment, legal, tax or any other form of professional advice. If specific advice is needed, it should be sought from an appropriate professional. Any liability, responsibility or warranty for the results of the application of the information contained in the analysis, either directly or indirectly, are expressly disclaimed by the author.